Ashley J George | AD-ventures of a Creative: Yay/Boo: Another ONE!? So this campaign just went up in the city. It has some decent lines . . . but there are little lines above the glass in script which you can't read until you are right up on the billboard . . . WHO APPROVED THESE? The billboard would have been better visually without the line above the glass. Though actually now that I am writing about it . . . 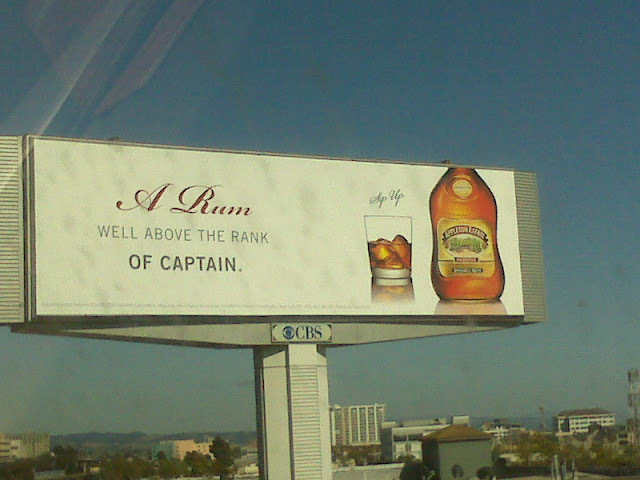 I don't know which rum this billboard is for. It reminds me of and makes me think about capitan morgan though . . . hmm probably not the goal. Yay: The layout of the headline. Boo: Don't remember who the billboard is for. Boo: Stupid script above the glass. Boo: Makes me think of Capt. Morgan instead of your brand.